2 in. X 2 in. X 10 ft. Drip Edge, 26 Ga. Galv. 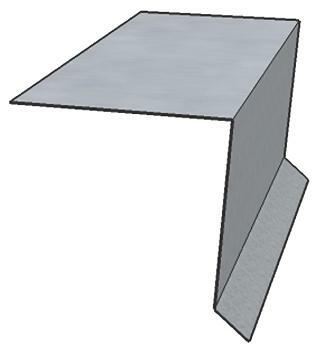 Drip Edge Roof Flashing Metal, 2-inch Face x 2-inch Top x 10 foot with 1/4 kick-out on face. 26 Gauge G90 Galvanized Steel. 10 foot piece. Price/Piece. SIZE: 2" side, x 2" on top, with 1/4" kick-out at bottom. FINISH: Plated to G90 ASTM563 standards. FINISH:Available in plain galvanized (paintable), brown, white, and in other sizes. THICKNESS: Available in 24 Gauge. LOCATION: Available from Chicago location.